Over the past few months I've watched a fading strip of St Clair West between Westmount & Oakwood Ave undergo some brilliant changes. New hip cafes, family-run eateries, shops and even a modern art gallery now inhabit a strip that 6 months ago was littered with sad empty storefronts. One such vacant lot now glows in bright blue and gold (coincidentally the school colours of Oakwood C.I. across the street) and has brought the locals out, rain or shine -- to line up around the corner if necessary -- for a chance to have a great midtown breakfast. BOOM Breakfast & Co opened a couple weeks ago, and still the crowds haven't thinned a bit. Saturday brunch was about a 20 minute wait but definitely worth it. Settling into a comfy new booth, my friends and I are presented with the menu which boasts a long list of breakfast dishes as well as all kinds of lunch options on the flipside. We debate eggs vs burgers, pancakes vs waffles and salad vs home fries... it all just looks so good. Our waiter is friendly, despite his hectic morning, and gives us plenty of time, while pouring fresh cups of bottomless coffee to aid in our decision-making. 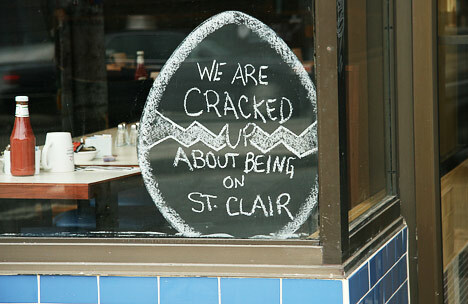 From the breakfast menu, I go for BOOM's Tuscan Eggs. 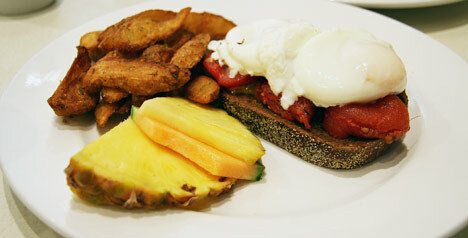 Two poached eggs over roasted tomatoes and rye bread, served alongside 'frites' and fresh fruit. A healthy pick that still hits the spot. "We'll be needing a side of these." Across the table, a friend orders up the scandalously named, Three Some (pictured at the top). Suitable for minors this included a pancake, two eggs, and choice of double-smoked bacon, ham or sausage. Classic and quickly devoured. 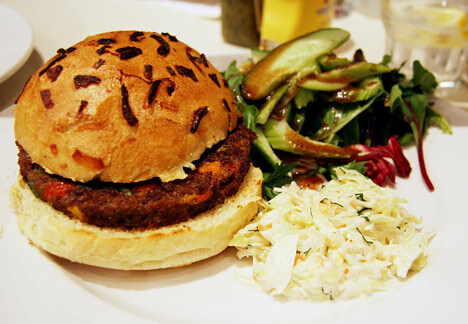 And next to me, the rebel of the group plucks a standard vegetarian choice from the lunch menu: the Veggie Burger. The patty was notably tasty (even our sausage fan across the table asked for a second bite) and matched up well with an onion bun, and side of fresh greens. Portions are generous but not ridiculous, leaving us full but able to walk home (always a bonus). 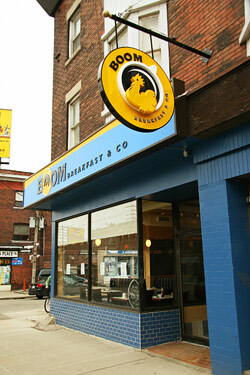 If waiting for your bacon doesn't fit into your breakfast schedule, try BOOM out during weekdays. I returned on Tuesday morning and enjoyed quieter atmosphere, no wait, and the same great service. Open til approx. 3-4pm every day.